Disclosure: Today’s guest post is written & sponsored by The Bedwetting Doctor. Bedwetting, although not often discussed, is much more common than you might think – in the UK, around half a million children aged 5-16 wet the bed. This means it is likely that there is at least one child in every primary school class that wets the bed regularly. Bedwetting can be stressful for a child and has been shown to have a negative impact on a child’s self-esteem. Bedwetting is very normal for younger children – in fact, around 30% of 4 year olds wet the bed at night. Whilst many children naturally learn to become dry at night, some children take longer – 1 in 10 children aged 5 still wet the bed regularly. Once a child reaches the age of 5, healthcare professionals recommend that bedwetting should be treated. 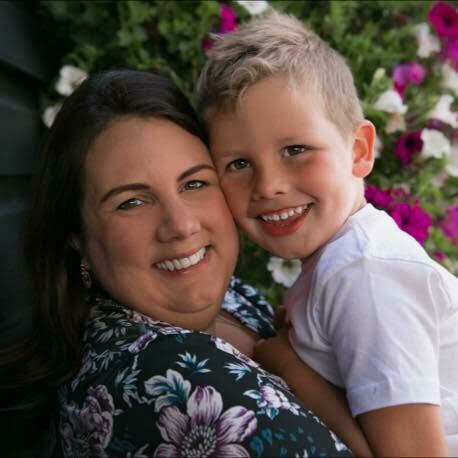 National guidelines (written by NICE, the National Institute for Health and Care Excellence) recommend bedwetting alarms as the first-line treatment for curing bedwetting in children aged 5 and over. Bedwetting alarms are the safest, most effective, efficient and economical way to permanently cure bedwetting. Most children that still wet the bed after the age of 5 have not yet developed the subconscious link between their brain and their bladder that enables them to sleep through the night without wetting. A bedwetting alarm helps to speed up the formation of this link. The Bedwetting Doctor sells the world’s leading range of bedwetting alarms – the Malem alarms. Malem has led the way in bedwetting alarms since 1979 and have been supplying the NHS with bedwetting alarms for over a decade. 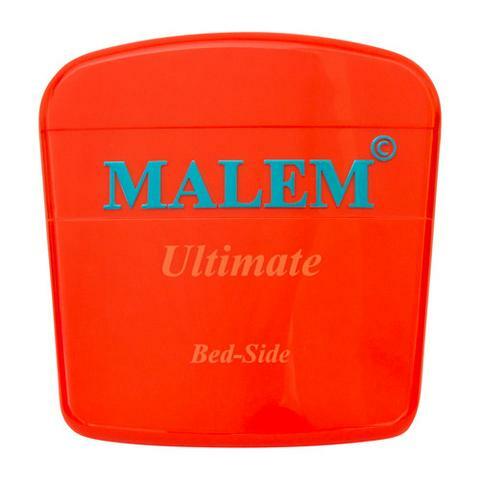 Malem bedwetting alarms cure bedwetting by speeding up the natural learning process that is needed to become dry. At night a sensor attaches to the child’s underwear, in the place most likely to detect wetting. As soon as the child starts to wet, this sensor sets off the alarm, which then wakes the child up by playing a loud sound and/or vibrating. This process of waking on the first signs of wetting cures their bedwetting. A whole range of Malem bedwetting alarms are available from The Bedwetting Doctor and it is important to choose the one that’s right for your child. The most popular alarms are the wearable alarms. These small alarm units clip comfortably onto a child’s pyjama top or t-shirt and are connected to the Malem Easy-Clip sensor, which clips easily onto your child’s own underwear. When your child wets, the alarm will quickly alert your child to wake up. (The great thing with Malem alarms is that your child can wear their own underwear, which ensures that your child is comfortable – some other bedwetting alarms require special underwear or for your child to wear a sensor in between a pad). 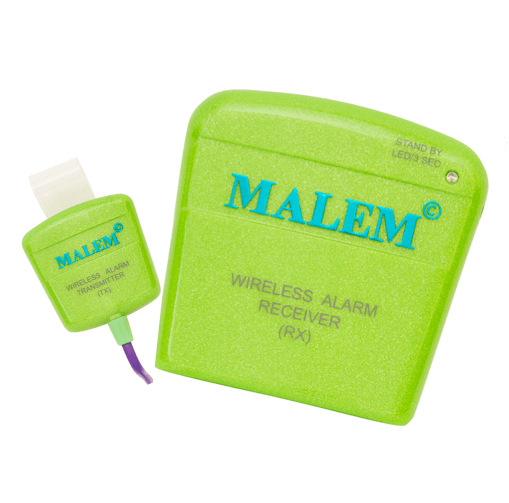 Malem wearable bedwetting alarms are available in a wide range of colours and specifications, which means that you can find the perfect alarm for your child. Some Malem alarms only sound when they are set off, whilst other ones vibrate as well. The combination of sound and vibration helps to wake up even deep sleepers! Additionally, the versatile Malem Ultimate range of alarms have a vibration only setting, which is ideal when you are looking for a more discrete option and don’t want to disturb others, such as in a shared bedroom. Other options in the Malem alarm range include choosing whether to have a single tone alarm, which always plays the same alarm sound, or an 8-tone alarm. These 8-tone alarms play 1 of 8 different alarms sounds randomly each time they are set off. This helps to stop your child from becoming too used to the same sound and ignoring it. Another option is a Malem Recordable alarm, which allows you to record either a short personalised message or a favourite piece of music, which will play when activated and wake your child in the night when they wet. These recordable Malem alarms are ideal for children with special needs, or those that might find a familiar voice reassuring when they wake up at night. Additionally, the sound of a familiar voice is very effective at waking a child up when they are asleep. If your child prefers not to wear a pyjama top or t-shirt to bed, Malem also make a wireless alarm. This alarm attaches only to your child’s underwear, and a separate receiver can be placed on a bedside table. This receiver sounds as soon as your child wets. Additional receivers can be purchased for the Malem wireless alarm and placed in the parents’ room, so that you can also be alerted when your child wets and initially help to wake them up. Another alternative if your child doesn’t want anything attached to them at all whilst they sleep, is the Malem Bed-Side alarm. This comes with a bed-mat, which is placed below the bedsheet. The alarm unit is connected to the bed-mat and placed on a bedside table. When your child wets, this will set off the alarm. For help in choosing which Malem bedwetting alarm is right for your child, The Bedwetting Doctor has an easy comparison chart that you might find helpful, or you can e-mail info@thebedwettingdoctor.com for more information. Bedwetting alarms have been proven to cure bedwetting permanently and are the most efficient and cost-effective treatment for bedwetting. A child that has regularly wet the bed their entire life tends to be cured in a matter of weeks, making night times drier and happier for everyone!